Koopa's Believe It or Else! 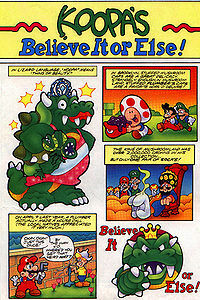 First appearing in Issue #1 of the Nintendo Comics System, Koopa's Believe It Or Else! is a parody of Ripley's Believe It Or Not! that reveals some allegedly true facts about several key figures in Mushroom Land. "In Lizard Language, 'Koopa' means 'thing of beauty.'" "In Brooklyn, stuffed mushroom caps are a great delicacy. Strangely enough, in Mushroom Land, stuffed plumber's caps are a favorite hors d'oeuvre!" "The King of Mushroomland has over 2,000,000 crowns in his collection... but only one pair of socks!" "On April 9th last year, a plumber actually made a house call. (The local natives appreciated it very much.)" This page was last edited on March 27, 2018, at 17:43.